The 1¢ 1873 Continental Bank Note Co. issue is extremely rare in plate block form. We have offered only one since keeping computerized records--a plate block of 12 with full imprint from Plate 209. The block offered here, from the left pane of the sheet of 200, requires seven stamps across to show the full imprint, thus requiring 14 stamps to be a complete plate block. This plate block is an excellent companion to the one offered in lot 127, which is from the same plate number but printed by American Bank Note Co. after it acquired Continental. The 2¢ 1873 Continental Bank Note Co. issue is scarce in plate block form. We have offered only two others since keeping computerized records--one from the bottom and one from the top of the pane, and both smaller than the block offered here. The 3¢ 1873 Continental Bank Note Co. issue is scarce in plate block form and particularly desirable from the top position. The Chapin census records only seven complete plate blocks of Scott 158. This is the first top plate block we have offered since keeping computerized sale records. This is the only recorded plate block of the 6¢ 1873 Continental Bank Note Co. issue in the scarce Brown Rose sub-shade, which was printed only from Plate 305. Despite the Scott Catalogue assigning the same value to this shade as the normal Dull Pink shade, examples are very elusive. Power Search does not list even a single in our sales since 1995. This block was originally part of a block of 16 when it was offered in Part 23 of the Colonel Green sales (Hugh C. Barr, 10/15-18/1945, lot 32). It remained a block of 16 until it was broken into this block of 12 and a block of four following the Siegel 1974 Rarities of the World sale. This plate block was offered again in the 1977 Rarities of the World sale before entering the Chapin collection. Overall for Scott 159, the Chapin census records only nine complete plate blocks, this being the only one in Brown Rose. The 7¢ denomination was dropped from the Bank Note series after the 1875 General Postal Union rates took effect. This is the only recorded plate block of the 7¢ 1873 Issue. This is the only recorded top plate block of the 10¢ 1873 Continental Bank Note Co. issue. This block was originally part of a complete right pane of 100 when it was offered in Part 23 of the Colonel Green sales (Hugh C. Barr, 10/15-18/1945, lot 48). It remained a complete pane until it was broken up following the 1974 Rarities of the World sale, yielding this top plate block and a bottom plate block (last offered in the Curtis collection, Sale 1084, lot 3426). 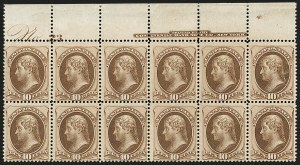 This top plate block of 12 was reoffered in the 1977 Rarities of the World sale before becoming part of the Chapin collection. Overall for Scott 161, the Chapin census records only three complete plate blocks--this the only top--but the third plate block is a bottom position without gum and with small surface scuffs (last offered in the Curtis collection, Sale 1084, lot 3427). This is the only recorded complete imprint and plate number multiple of the 30¢ 1873 Continental Bank Note Co. issue. No plate blocks are known, and the only other multiple with a plate number is a block of six without imprint (Siegel Sale 1014, lot 1411). This strip appeared in Siegel Sale 408 in 1972 (lot 282). As this strip vividly demonstrates, Continental Bank Note Co. used the National plate to print 30¢ stamps in 1873, leaving the National imprint unchanged. This is one of only three recorded complete imprint and plate number strips of the 90¢ 1873 Continental Bank Note Co. issue. One of the others is offered in lot 125; the third comes from the bottom position (Curtis collection, Sale 1084, lot 3436). 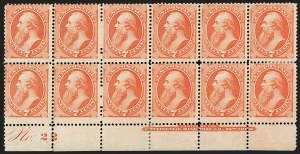 No complete plate blocks are known of the 90¢ National or Continental issues. The Chapin book records the unique plate number block of four without imprint (2012 Rarities of the World, lot 172). There is also a block of four with imprint only (Whitman collection, Sale 968A, lot 202). As this strip beautifully demonstrates, Continental Bank Note Co. used the National plate to print 90¢ stamps in 1873. This is one of only three recorded complete imprint and plate number strips of the 90¢ 1873 Continental Bank Note Co. issue. One of the others is offered in lot 124; the third comes from the bottom position (Curtis collection, Sale 1084, lot 3436). 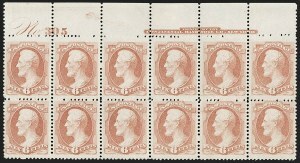 No complete plate blocks are known of the 90¢ National or Continental issues. The Chapin book records the unique plate number block of four without imprint (2012 Rarities of the World, lot 172). There is also a block of four with imprint only (Whitman collection, Sale 968A, lot 202). As evidenced by this imprint and plate number strip, the National plate was used by Continental Bank Note Co. to print 90¢ stamps in 1873. We record only four complete imprint and plate number blocks of the 2¢ Vermilion 1875 Issue (the Chapin census records only three), with this the only block from the desirable top position. The other three, including one plate block of 14 and two plate blocks of 27, are all from the bottom positions.